One way I can tell that a burger joint is awesome is I hear lots of good things about it from friends and readers. About a month before I made the trip I heard about Bubba's. A few weeks went by then I heard from a close friend that I had to go there. Then another. And another. I started looking around the internet to see if the local newspaper or TV stations had been to Bubba's. I found that Fox Channel 26 had indeed been there. All of the reviews and word of mouth recommendations for Bubba's was too much for me to take. I went to Bubba's despite having strep throat. Even my illness wasn't enough to keep me from this place. When Bubba's came into sight - I knew I was in for a good experience. This place is Texas to the bone. Plain and simple. And Bubba's burgers met and even exceeded my expectations. Oh my friends - this burger is a big ol' messy burger. Upon taking my first bite a lot of stuff fell out and ran all over my fingers. That to me is a good thing. The patty was plenty greasy... good oooze. Bubba loaded me up with ketchup. He also gave me some mustard to go with it.. so it created a pretty unique - although very good flavor. Very greasy. Very moist. Excellent flavor. 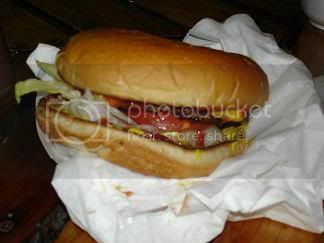 When I think of the Bubba's cheeseburger - a huge and meaty patty is not what I think of. Don't get me wrong - the meat on this burger was big enough to fill me up - but it just wasn't a Kincaid's type burger where the patty is an inch deep in the middle of the burger. I'm learning that chemistry is an important part of a tasty burger. Chemistry in the burger world is the way all of the flavors come together. The lettuce, tomato, meat, bun, and mayo/mustard. This where Bubba's excelled. The chemistry was FANtastic! Excellent flavor in the bun. Excellent seasoning on the meat. Overall - an excellent although not a huge patty. Definitely a 2 hander.. No one handers here. This burger was big and bulky. It was a lick your fingers after you bite into it type burger as well. Really good. The cheeseburger was $5.43. The Bubba's burger left me feeling very full and very satisfied so I'd say it is well worth the money. I have had burgers before that didn't quite fill me up and I paid a lot more for them. Nothing worse than paying a lot of money and still be hungry. I already mentioned that Bubba's doesn't have fries, O-rings, or tots. I could take my pick of chips or jalapeno potato salad. I opted for the jalapeno potato salad. MAN that was awesome! Highly recommended. 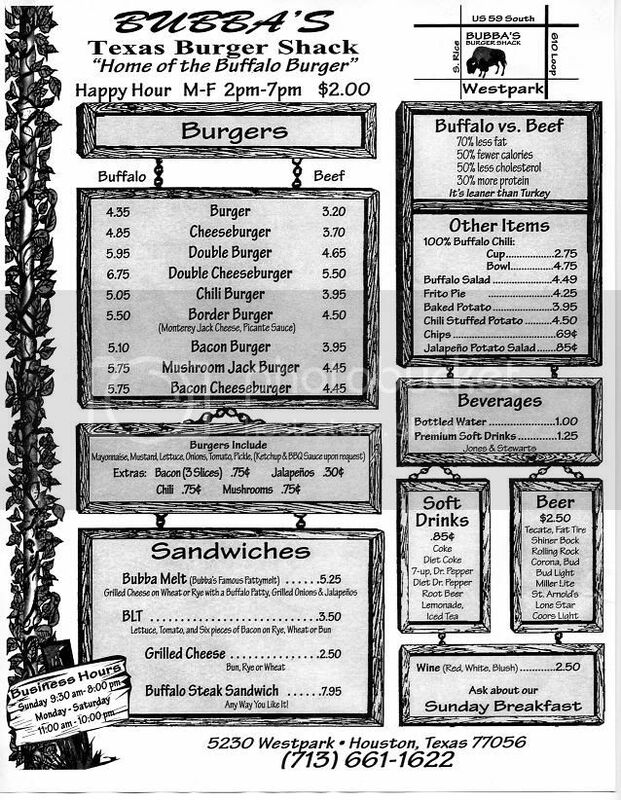 Bubba's menu is very unusual. You'll find LOTS of dishes with buffalo in them. Bubba's was the second burger joint I have been to that served an Buffalo burger. The buffalo meat is much leaner and better for you than even turkey. While you should take care of your heart and ensure that you are eating good foods - that wasn't the intent of my visit to Bubba's. I wanted to clog an artery or two. Buffalo meat probably doesn't have the same oooze factor as the beef counterpart. Mrs. TexasBurgerGuy tried the Buffalo Salad which was a good looking salad with a buffalo patty parked on top of it. I tried the meat and it was great. The jalopeno potato salad was definitely awesome. Gotta try that! Bubba's Texas Burger Shack is not just a clever name. This place is definitely a shack. It is great though. There is a wooden deck out on the front. There are 2 or 3 tables inside the actual place - guess most people eat outside. Bubba is a very nice guy. Do yourself a favor and strike up a conversation with him. The interior of Bubba's is also very memorable. Not sure quite how to explain it other than to say Bubba is PROUD to be an American. Lots and lots of American decorum in this place. Some very humorous signs including my favorite... "I love animals... with potatoes and gravy." There are several autographed pictures of various musicians and models that have eaten at Bubba's. I am not doing this place justice. You really need to see it to know what I am talking about. It is great!!! Bubba's is located literally under the Westpark Tollway. We went North on 59 towards the loop and exited Chimney Rock. Go south on Chimney Rock to Westpark and take a left. You will see Bubba's just past South Rice road. Can't miss it. It is the only place out there. Eating at Bubba's is quite an experience. You get to meet a nice and genuine man. You will see one of the most creatively decorated burger joints out there. You will get to try buffalo if you want to. And you are guaranteed a VERY quality burger. I will add Bubba's to my "will definitely return again" list. I have been reading your reviews for a few weeks now and I must say you are a man after my own heart. Christians Totem is amazing and I can't wait to try Lankford's grocery. 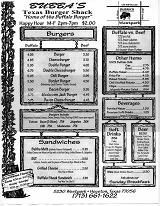 I know that you are from the Waco area so I am surprised that you have not rated any of the burger joints in Waco. I lived there for four years while going to school and I am convinced that all burger lovers should make a pilgrimage to this burger Mecca. I don't want to be long winded so I'll just list the top three burger places in Waco and assert that they will compete with most of your top five. 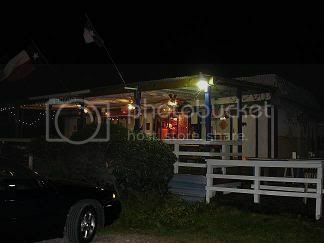 Honorable Mention: George's Bar (made famous in the Pat Green song) and Kitoks. I saw you on food network with the hungry detective!! I didn't even know about about this blog site or that place and im from houston!! So now I am def. going there for lunch!! thanks to you and food network! My friends and I go to Bubba's at least once a week. Sit at the same table--order a bucket of Lone Star and have a great time. One of the employees- Ed- is a great guy. Will talk to anyone about anything. Keeps us company after he's turned out the lights and were finishing our buckets. Buffalo Bacon Cheeseburger on a wheat bun with a side of Jalepeno Potato Salad is hard to beat. Just moved to Amarillo,Tx. and have found the burger of my dreams! It's at a place on I-40 called "Blue Sky". What makes this burger soooo good to me is that they put the garden (veggies) on the bottom. They way it hits your palet is amazing. You've just got to try it!!! I have had buffalo burgers for sure they are a 10 on the bling bling scale! Chili burger, Chili burger, Chili burger. Did I mention the Chili burger? I went to Bubbas last week for the 1st time. I went there on a recommendation and I was blown away. I had never tried buffalo before and I thought it was great. The burger was not huge but the meat tasted great and it was very filling. They have a very friendly staff! And the Saint Arnolds beer was Super Cold. I WAS EXTREMELY DISAPPOINTED IN THE BUFFALO BURGER. IT WAS NOT THAT GOOD AND HAD A TINY TOMATO COVERED WITH LETTUCE. I live in Buenos Aires, and my first visit to Houston was in 1996. Ray, a friend of mine who won several awards on cooking, recomended me "Bubba's" as the best buffalo burguer place. Now, every time I go to Houston, I go there and ask for a cheeseburguer and a bag of nachos. I am a big fan of this place. I wrote something about "Bubba's" a couple of days ago, and I don't see my comment here yet. I would like to know what happened. Don't forget to try the Buffalo Patty Melt at Bubba's. You basic patty melt ingredients plus pickled chopped jalapenos.... IT IS SO GOOD. I hadn't heard the hype when I first came here, and I was a little freaked out when my boyfriend drove up to the place, which is situated on an island between two highways. No way this could be romantic. But then I had the real sugar (no high-fructose corn syrup here!) soda, the jalapeno potato salad, and, best of all, the INCREDIBLE buffalo burger. Now I'm addicted to the place. It's my favorite place to go on a date, and I've been to Ruth's Chris more than once, believe me. 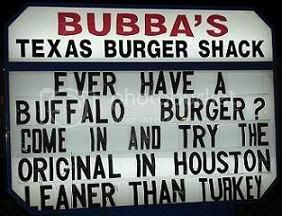 ThomasWe checked out BUBBA'S TEXAS BURGER SHACK in Houston. It's on Westpark and Rice. It's literally a run down shack located underneath the 59 highway bridge. They have good reviews. I had the Bison burger and Jalepeno potato salad. The Bison was not as tender and bold tasting as the one I tried at Moonie's in Austin. Overall it was good. They do not serve fries here (thumbs down). The guys working here are hard-working, very nice and accomodating. There is not much seating available inside. My rating: 8/10. The place is amazing, but what no one has mentioned is the phenomenal sunday brunch!!! Buffalo breakfast tacos, omelets, migas, and of course $.50 mimosas. I get the double buffalo cheeseburger every time and of course put on some of the hot sauce every three or four bites. Go experience it!! 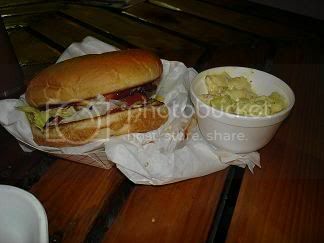 Try the burgers at Little Matt's @ 6203 Edloe Houston, Tx 77005. Its located in the heart of Southside/West University Place. My recent visit there has confirmed what coworkers have been telling me! Its awesome!